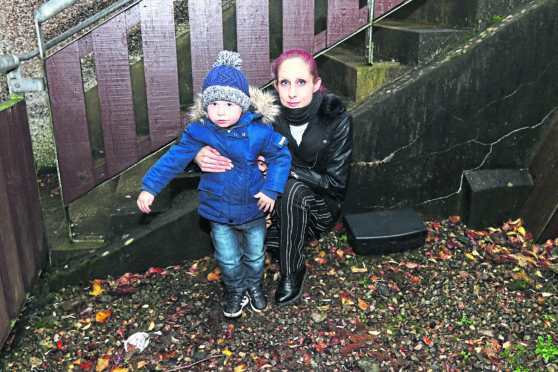 Alison McKnight and her son David Laird 2 near the rat traps at her home. Residents of a rat-infested block of flats in Oban are furious after receiving letters that their indoor drying areas are to be locked forever due to antisocial behaviour. But West Highland Housing Association, the landlord at Burnside Court in Oban’s Miller Road, said the action is being taken in consultation with its tenants. The doors to the two rooms will be secured tomorrow to stop teenagers hanging about, other aspects of antisocial behaviour, residents were informed by letter this week. WHHA said it has provided additional outdoor drying areas to replace them. Last week Alison McKnight, who lives in one of the flats with partner Damian Laird and two-year-old son David, told of her shock to discover rat traps dotted around the building. Despite never being warned of any problem by the housing association, there was one in the close outside their flat, one outside and two in the drying rooms. And now the latest complaint from tenants is the closure of the drying rooms. Miss McKnight, who shares a one bedroom flat in Burnside Court with her family, did not receive a letter. She said: “I spoke to a couple of tenants, who all want to keep the drying rooms. It would have been nice to have been given some notice about it. “I have got nowhere else to put my washing, I’m going to have to string a line up in the living room. “There have been no teenagers in that drying area for years. Graeme Bruce, operations manager, West Highland Housing Association, said: “We had a consultation last year and it came back that people were happy for them to be secured. We did additional environmental works and increased the outdoor drying facilities at Burnside Court. “They are not nice places. They were attracting kids or teenagers and aspects of antisocial behaviour, which is why we are doing this.